These sign base stands maximise your space, featuring a double-sided sign that reaches more people from a small footprint. The portable signage display includes a 700 x 600mm aluminium panel that is 4mm thick. Custom designed graphics are digitally printed on each side of the panel, displaying in full colour to help alert passersby to your business, booth, menu items, ongoing sales, and more. The panel has notches on the bottom, helping to keep it in place within the 4mm wide centre channel. 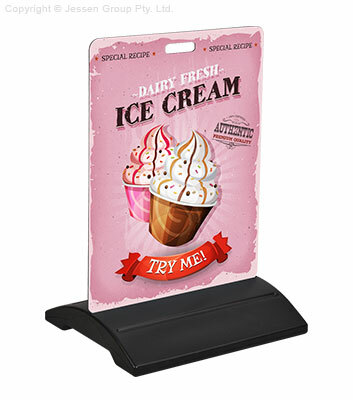 The outdoor advertising displays, sign base stands uses a lightweight ABS black plastic base to hold the signage in place. This durable material is long-lasting and inexpensive for a stand that works within any budget. The base is designed to be filled with up to 15L of water or sand to provide a stable stand that will remain in place even in light wind conditions. A screw-in plug on the bottom keeps water and sand within, and there is a rubber gasket to prevent leakage during use. The base is only 400 x 600mm, taking up little space in front of your store, booth, tent, or school whilst still being readily visible thanks to the large sign. The base weighs only 3kg when empty as well, making it easy to transport and store between events. Slimline Warehouse provides fast despatch to anywhere in Australia, order for your location today! Please Note: This product is not intended for use in inclement weather, such as heavy rain, extreme heat or high winds.